Living a clothed life really seems discouraging when those piles and piles of clothes to wash don’t stop a comin’. That relentless mass of apparel gives no holidays or time off. If you dare try to give yourself even a week, you’ll find yourself threatened to wear that awkward combination of clothes that would make you want to hide behind walls in public, find your children decked out in flood pants from last year and your husband…well, he might actually be fine with the nudist thing. But there must certainly be a better way! Are we really going to be defeated by an accumulating pile of clothing and undies? I dare say not! Here’s what’s worked for me so far (as long as I actually keep it up…). We bought these laundry bins from Ikea a while ago. They affordable and hold a lot of clothes for how much space take up. We have two bins, making four comparments: darks, reds (both of us being Utes and red being one of our favorite colors has made for it to be its own section) lights and whites. It’s easy to keep clothes organized, we throw our dirty clothes across the room and try to make it in its proper place, it’s fun. I take my little boys’ hamper and quickly sort it into the bins when I need to. So, we’ve had our clothes relatively organized for a while now but I still found myself with nothing to wear because of severe laundry backup. Well, I heard of the good ole’ fly lady and went to her site and learned that she would do I pile of laundry a day. This idea seem absurd to me because I didn’t possibily think that our 3 person (at the time) family could have enough laundry on a daily basis to do a load a day. Well guess what, we do. I tried it, taking a load a day to wash, to switch and to fold and an amazing thing happened. The loads got so small and so managable, and easy, it was fantastic! I actually started to look for things that needed washing. Linens and towels was the one I always forget about and it was miraculously and willingly getting done. It was such a good feeling. The trick was to get that pile in the wash, switched and folded as part of a routine, so you wouldn’t even have to think it about it. Mine was right in the morning and switching the load was after breakfast. Folding and putting away was the real challenge, I couldn’t find a good time to do it everyday. As for now, it is at night with the hubby when we are unwinding watching T.V. or talking. 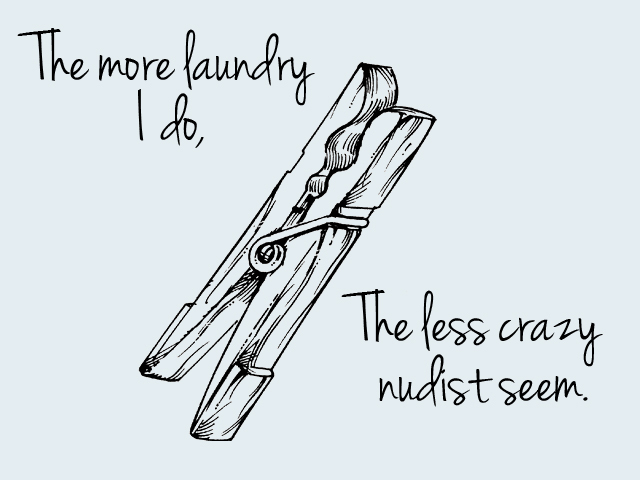 It serves triple purpose: unwinding, time with the hubby, and laundry. Here is an update on my new trick of how I fold and put away laundry now! Aren’t those beautiful, comforting words? What laundry tricks and tips have worked for you? Please share in comments below! Funny, I roll much like you; same 4 batches, I try for a load a day, but still struggle with folding and putting away. A new challenge is that my little princess has entered the stage of several changes of apairal a day, the dirty and the barely warn get tangled together and not even the clean stat folded.. Any suggestions out there? I find it helps to get a load ready to go the night before, then it’s easy to get it spinning first thing in the morning. Ha, that’s great, I struggle with keeping or putting on clothes on my boys while your case is the opposite! 😀 Not sure on keeping up with all the changes of apparel… But YES getting the load ready the night before is EXACTLY what I do now since morning are so crazy-sometimes I even dump it in and get it rolling and just switch it first thing in the morning, helps a ton.